The Forgotten Photos: You never can tell what you might find in the bottom of a suitcase. 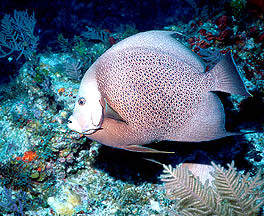 Click here to see this spectacular Gray Angelfish from The Bahamas. 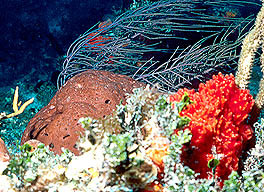 The "forgotten photos" were from a reef in The Bahamas where the ocean current was fierce. Click here to see the soft corals bent by the force of this current. 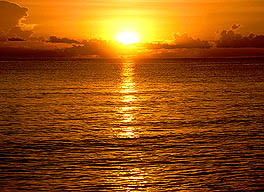 As usual, we will end this volume of e-ReefNews with a picture of a tropical sunset. This year, the picture is from San Salvador in The Bahamas. Click here to see this sunset up close.